The award is presented annually by the Biloxi Race Producers in honor of Randy Linebach, Team Airborne #24 who lost his life on Friday, April 23, 2004 during a test run for the inaugural Smokin' the Sound. Randy began his racing career in 1994 when he built and raced the boat "Aftershock". He made his national offshore debut in June, 1999 in Corpus Christi, Texas with the "Cat Can Do" team. He then raced his own boat, "Airborne Big Thunder" on national and divisional circuits from 2000 to 2003. Randy was a designer and builder of 50’ and 53’ luxury high performance catamarans. 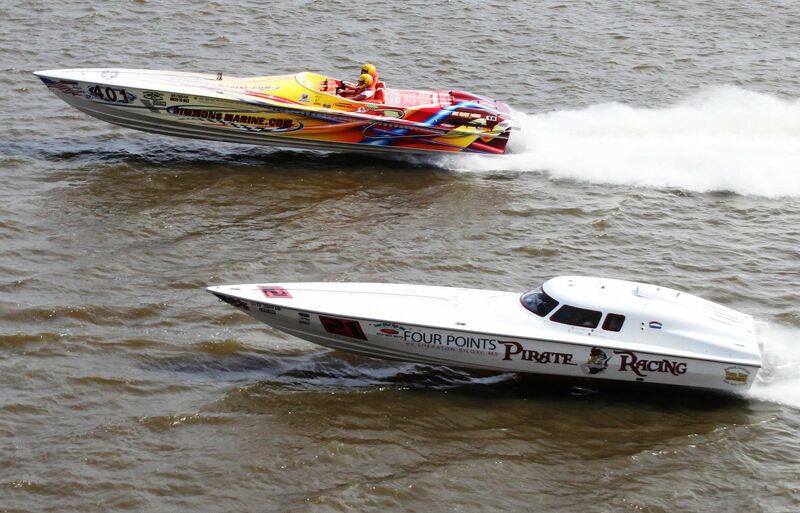 Randy was one of the founding members of the Offshore Super Series Powerboat Racing Association and was part of creating the vision of the then new organization. The perpetual trophy recipient is selected by a vote from each race team for the racer in any category demonstrating exceptional teamwork, sportsmanship and camaraderie. The original Randy Linebach Lighthouse Award was displayed at Biloxi City Hall. In 2006, the only year Smokin' the Sound was not produced and no award was issued, Hurricane Katrina claimed it along with all but the spirit of Biloxi. Race Producers Woody Bailey, Rusty David, Asher Travis and Gene Oswalt re-created the inspirational award, then defiantly placed it on the crane at water’s edge for the 2007 Smokin’ the Sound race. This year’s winner was the ninth recipient overall. In 2005, the very first award was presented to Billy Mauff of WHM Motorsports, by Leah Linebach, Randy's daughter. Hurricane Katrina preempted "Smokin' the Sound" in 2006. In 2007 the award was presented to Steve Page, 2008 Randy Schleuss, 2009 Ryan Beckley, 2010 George Auriemma Jr., 2011 Jim Simmons, 2012 Kyler Talbot, and 2013 Mark Niemann. Marc Granet presenting the Miss Geico $1000 Linebach award check. When he received the award, Dave said, (with a choked voice and damp eyes), "I am at a loss for words; to receive this incredible honor is overwhelming. I want to thank all my fellow racers for this wonderful honor. I will always strive to uphold the values this award bestows." Dave, chatting later at dinner after receiving the award, said "It's certainly an honor and if you look at the past winners of this, it's a special group to be part of and that's something I'm very proud of and very humbled by. I was just stunned when they announced it and it is still almost impossible to believe". Dave's team, Pirate Racing, was OPA national champion of Super Vee Lite in 2012 and is certainly a deserving winner of this award. Some have asked why he has Pirate Racing inscribed on the side of his powerboat. Dave had an ancestor who was a Portuguese pirate whose boat sank off the North Carolina coast. His ancestor survived, and settled in western North Carolina. In talking with some of his teammates, past winners, and fellow racers it is obvious the respect they have for Dave both on and off the course. Wil Smith, of Phantom Boats, said "Dave is just a wonderful sportsman. He brings family to the sport. Not just because he brings his own family to the race, but in the pits or between races it's as if everyone around him becomes part of an entire family of offshore racing because of Dave's attitude towards all. That is so rare anymore". Randy Schleuss, of Typhoon Racing, when discussing Dave's winning the award said, "Dave just shows tremendous sportsmanship no matter what the situation. His team had so many obstacles they overcame before winning the championship in 2012, but they stuck with it when most others would have just quit. And even after a bad race, his smile and positive attitude was always there for the others". Jim Simmons, "Dave is always helpful, always there with a possible solution no matter the issue, and always willing to even help competitors. Just a great racer and person to be around". Ryan Beckley, "Dave has done a tremendous amount to support the Biloxi event and as a father and son team stuck it out through all of the politics, turmoil, and uncertainty which has been such an issue recently in offshore". Jim Speros talked about how much it stuck out in his mind how Dave was going to run the boat for a year but here it is 5 or 6 years later and they are still running as a family and having fun. Martha, Dave's wife, when asked about the Speros comment laughed and recalled, " I remember that. They wanted to go racing for a year so were going to buy a boat, fix it up as a racer, then sell it after a year and we would make some money. I thought, great, I can handle a year of racing", (2006 was Pirate Racing's rookie year in their black Magnum P5 open boat). She went on to say how much she enjoyed the quality time Dave and Travis, (their son and on throttles for Pirate), were able to enjoy racing together and that she was glad it had gone past the one year timeframe and they were enjoying themselves. His son Travis says there is really no one instance that sticks out in his mind about things Dave has done to promote the sport and bring sportsmanship to all of the offshore events. He recalls that doing those types of things are just part of who his father is. It's normal for Dave to be that way all of the time. One of my favorite quotes came from Lance Sutton, and trying to get some additional insight from him went nowhere because Lance said it was complete, "Dave is the nicest guy in offshore racing", and that was it. From my perspective, it does pretty much say most of what I think. But, because of everything which has been stated above, I must add that Dave, Travis, and Martha are a must see and chat with at every race. We've been there when they've had tough losses, and also had incredible wins. In either case, Dave is the true sportsman congratulating those who have bested him and being considerate to those he has bested. I've seen him do things to help other teams race that I may not have done, sometimes even costing himself the win. Almost always with a smile and a cheerful, "But we'll get you next time". Congratulations Dave, you definitely deserve to have your name on that trophy and the Linebach's would be proud of what you bring to the sport. I can also add that in the second race on Sunday, the "Run Whatcha' Brung" race, Pirate and us in Simmons Marine were evenly matched because their ballast tank controls screwed up. They could not carry their normal speed down the straight so we got the jump off the start with the twins versus their single. They caught and passed us three times I think, we got them back every time. I bet there wasn't over a couple hundred feet separation the entire race. Anyway, after the race, when I went to chat with them and found out about their ballast tank issue, I found out I'd pinched them down the straight on the next to the last lap. We had watched them the entire race because they'd tuck in behind in the rough and we couldn't spot them, then they'd sneak out on one side or the other depending on the next corner and what they thought we'd do I think. Anyway, we missed them sneaking out on the inside by the wall and I found out after the race we squeezed them to where they had to cross our wake and come to the center of the course. I apologized when I found out, but Dave said that's racing in his usual voice with his usual smile. Travis said we need rear-view mirrors on the boat. Well, maybe that's racing, but certainly not if I'd done it on purpose which is the first conclusion a lot of people would come to. An incredible sportsman who we always enjoy being around.